Brook but when the growing spa town of Leamington needed a good direct road to Warwick in the 1820's the dip down to the brook was too steep and muddy for carriages and so a bridge was built across it. 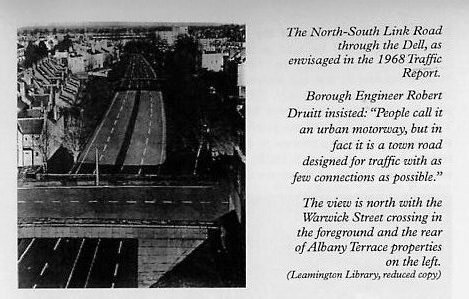 The stonework of the old bridge is still clearly visible today on the side of Warwick Place opposite the Dell (see photo right). 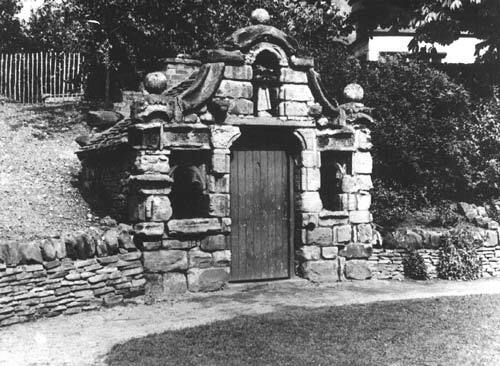 Later the stream was culverted but the Dell remained in private hands until 1945 when ownership passed to Leamington Corporation. It was officially opened as a public park on 12th May 1948. 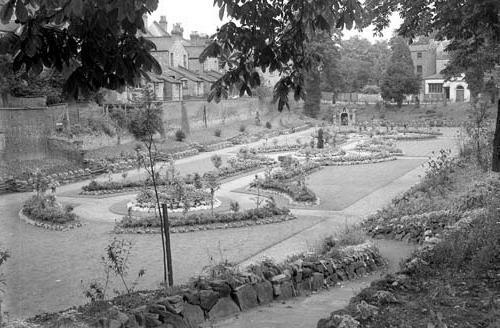 At that time the Dell was laid out with flowerbeds and paths, as the photograph shows, but over the years it gradually became neglected. The flowerbeds were grassed over as an economy measure, but the outline of the paths and beds can still be seen, especially in dry weather. 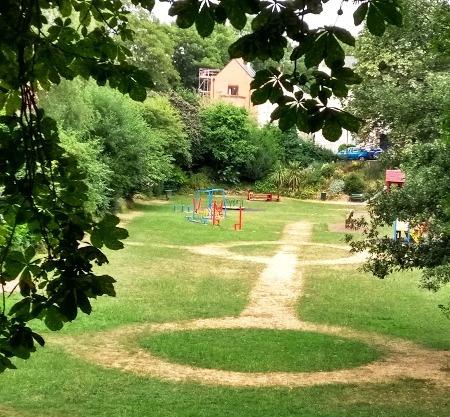 The Dell began to acquire a rather unsavoury reputation until 1996 when Friends of the Dell started a campaign to improve the quality of the Dell and make it an attractive amenity for all local residents to enjoy in peace. The so-called "Mosque" in 1956 which can be seen in the preceding picture just to the right of centre. It was originally built as a summer-house in the early 1900s. The stone came from the demolished "Pepper Pot" chapel which stood at the corner of Milverton Terrace and Warwick New Road. After the public opening of the Dell it was converted into a shed to store equipment. 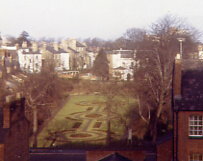 The Dell as seen from Westbrook House in 1966. By now the "Mosque" has gone. Photo courtesy of Margaret Marshall. Fifteen men - and women - went to mow back in May 1971. Members of Save Leamington Action Movement (SLAM) brought their own old rotary mowers to protest at the poor maintenance of the Dell. The beauty spot had been changed into a children's play area 18 months earlier and protesters were concerned it was being neglected as the then borough council prepared a proposal to build a road on it (see below). But news of the demonstration leaked out and the council mowed the area before the protesters could arrive. The protesters went ahead regardless, claiming the grass had not been cut properly. SLAM had formed a month earlier at a public meeting and dedicated itself to preserving the old houses and trees of Leamington and improving the environment. With acknowledgements to the Leamington Times, 18 March, 2009.